Proof here, here and here . Sparkles also make me happy. I don’t like zombies or barbed wire & fire. Wine & Krispey Kreme wouldn’t really work out for me and I’ll skip the hot dog… though I may take you up on the hot chocolate.
. Then NYC was announced – score! Only I was scheduled to be out of town that weekend ….. major bummer. 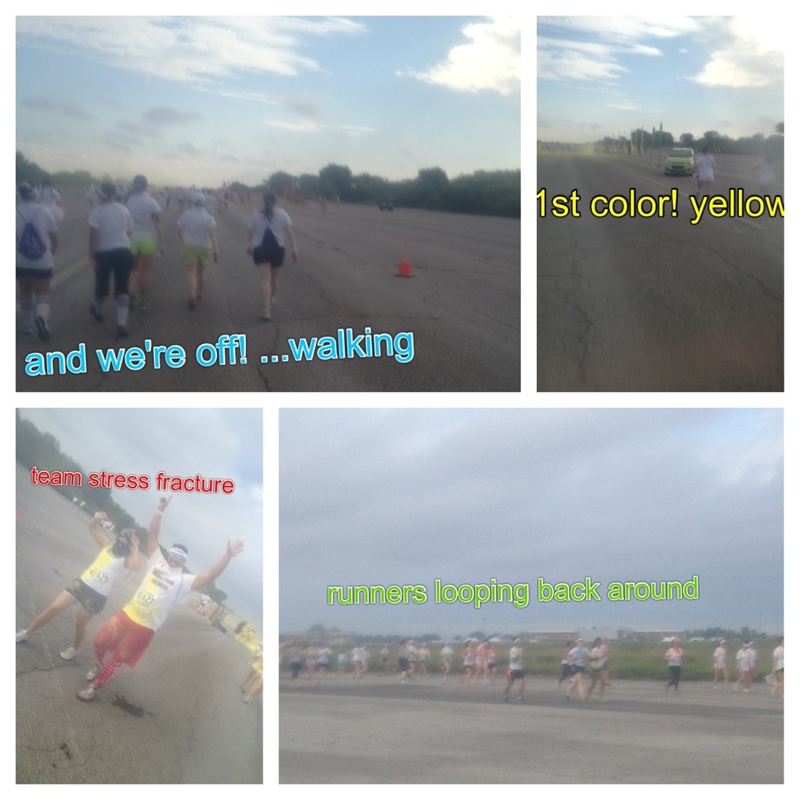 Then that plan started to fall through and the possibility of the color run became real. It was nearing sign up date and I would have to make a quick decision …. and once again gather a gang. This time I reached out to everyone: my friends that run, my friends that kind of run, my friends what would choose anything but a run, former co-workers who I’ve seen become more active …anyone and everyone. I stressed that it was a fun run (nothing to do with crazy marathon training). Quickest turn around ever. Is that what stock brokers feel like? I warned everyone that it would be sold out within 24 hours. We got a team – a mixtures of friends and friends of friends – the perfect kind. Even better, I learned some friends were signed up with other teams … I didn’t care who they were with I just wanted everyone to come! I planned to run it. Not as a race but a run none the less. It was Sunday and would be a flex day of 5 miles anyways so I would knock out 3 recovery ones instead of with the usual UGS / Ahthleta group. And then that silly little potential stress fracture happened. Running was out. 100%. Since my shin doesn’t feel aggressive, it just wont go away, I decide that walking …and taking it very very easy would be fine. Some people might vote otherwise. I didn’t want to miss the party! I promised myself after the walk I would really lay off the leg to get healed so I could get back out there. Plus I didn’t officially have my diagnosis / MRI results back so that made it ok right? Ok ok, I promised I paid attention to what my body said. Luckily (or not) one of my friend is also coming off an injury and needed to take it super slow. We agreed the only way it was happening is if we walked – we used to walk all around Italy during our semester abroad together so we need we’d be good walking buddies! I ended up not falling asleep until after midnight Satuday (nothing to do with partying ….not liking this new trend…) and it was rough waking up. In fact I didn’t actually wake up until we hit the start line. I had my iced coffee and toast with peanut butter as usual but didn’t cut back on insulin – I’d have my spibelt with gummies just in case but knew we’d be taking it easy. Some friends that leave a block down & I split a car service – best.idea.ever. since it was in who-knows-where Brooklyn and required buses and subway. We hung out for a bit at the tents checking out sponsors, catching up and waking up. 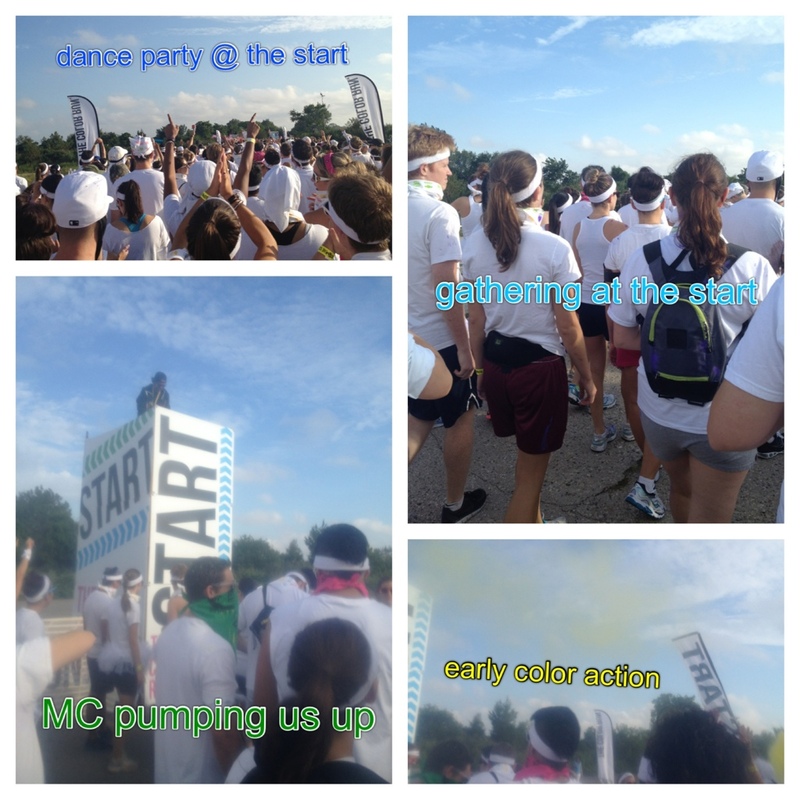 We started to make our way to the start, loosing a few in the process but getting amped up. It worked. I really really wanted to run. Instead we danced. As we got closer to the start I knew we would be trampled in the take off and tried to stick to the right side. As we crossed over in a jog I was reminded that running was not a good idea and made it two feet before walking. And from there the people watching kicked it up. It was at an old airstrip (i think?) and was a spacious course. I can get super excited about these events when telling someone about it but when it comes to the actual event I’m not very outgoing – in fact straight up awkward. So no crazy color grabbing antics from me. Though I was kind of jealous of all the bright knee socks and tutus. Even saw a couple of wedding dresses. I left my compression socks at home to avoid them becoming tie -dyed and opted for KT Tape in neon pink instead. By this point my phone went in a baggie for protection and pictures got a little blurry. There were people doing snow angles in the powder. I can get excited when talking up the event but when it comes to game time spirit I’m less than outgoing …. in fact often straight up awkward. 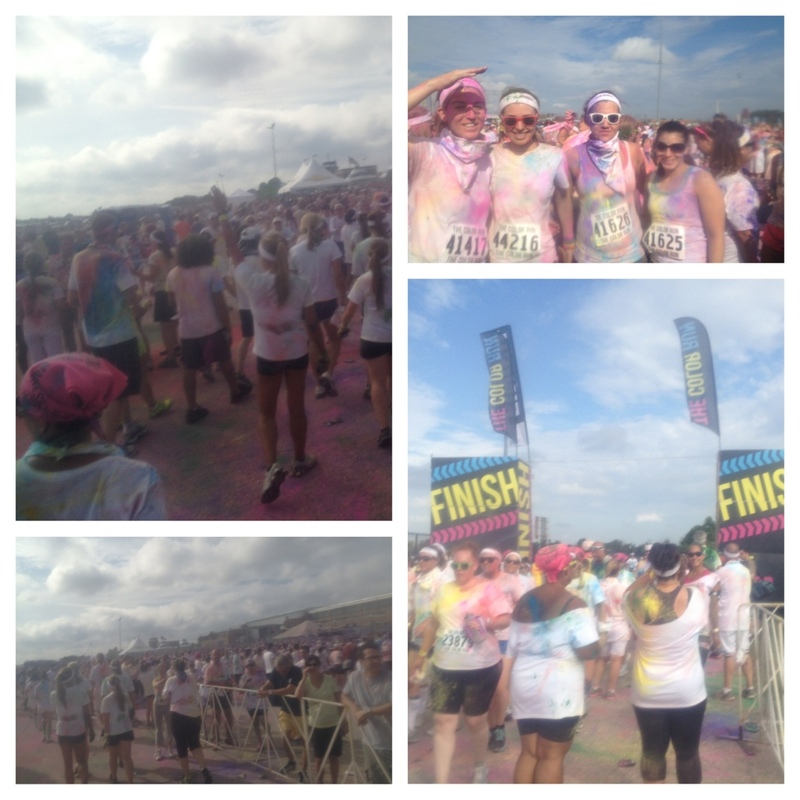 I think running throw the color stations would have been a little bit more exciting but we still had fun and got plenty of color. You were suppose to save your packet of color (the stress fracture squad all had blue) for a group toss but we didn’t last much longer than the finish line. We met up with the rest of the crew before splitting up to head home. UES’ers took a car back again ….. 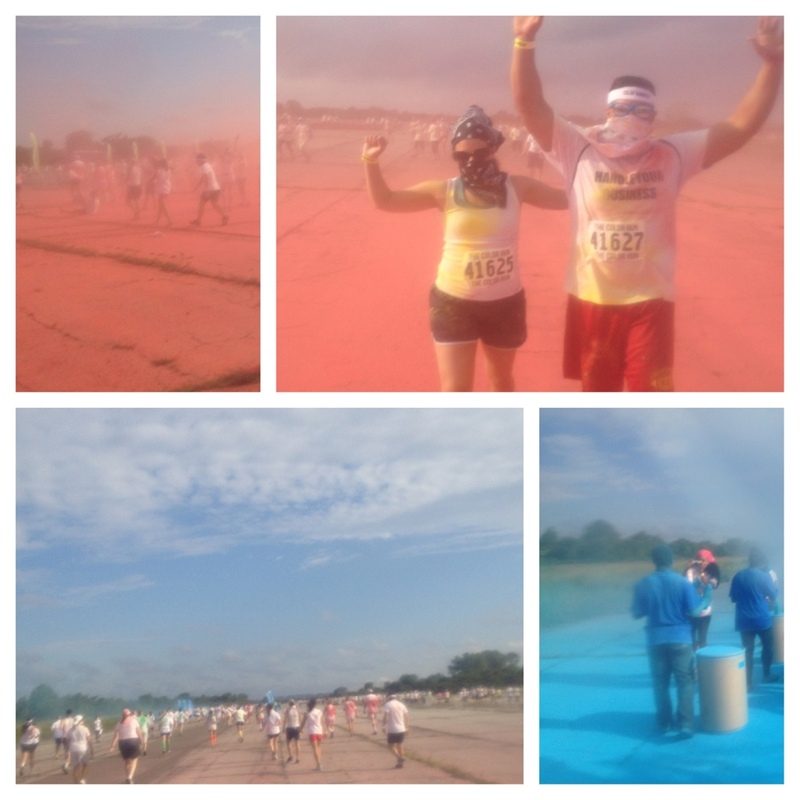 I may have left some blue behind…..
Have you ever done a themed run? 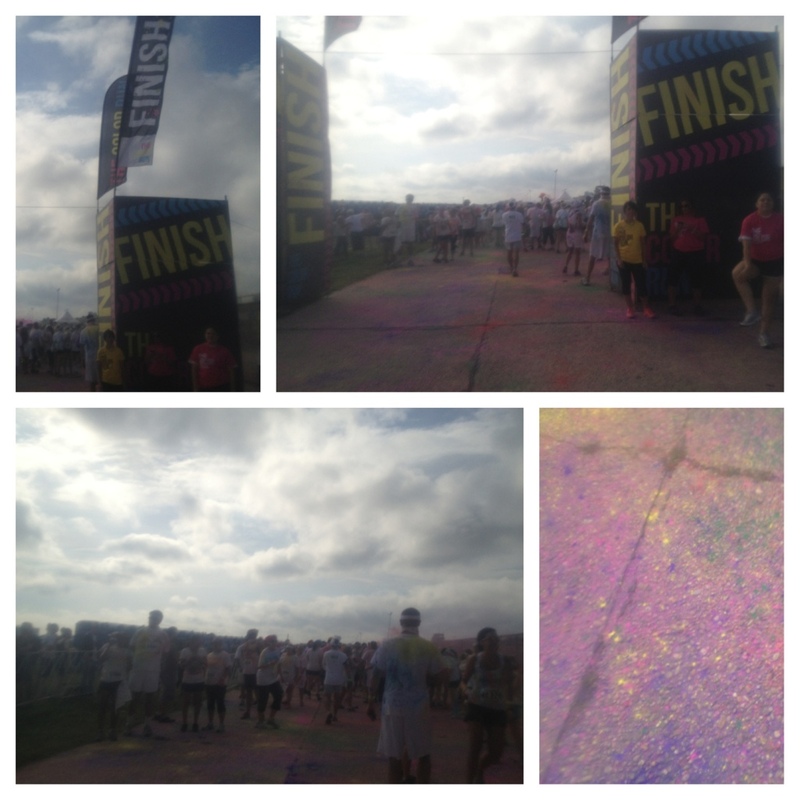 Ever done the Color Run? 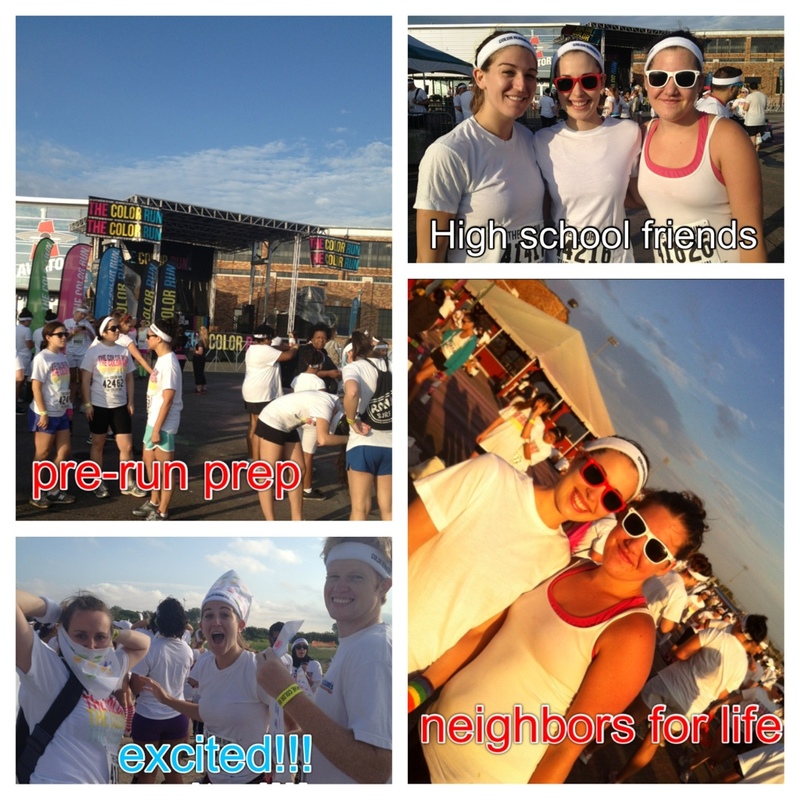 Categories: Running | Tags: 5K, Boston, Brooklyn, color run, friends, fun run, Group run, nyc, pictures, race, running, Stress fracture, themed run, walking | Permalink.